From July 1 2015 to the present day the business – which is committed to delivering excellence in customer experience – has sustained a ‘world class’ Net Promoter Score (NPS) of 94. NPS is an index which ranges from -100 to +100 and measures customers’ willingness to recommend a company’s products or services. Synergy’s passion to consistently provide a top class customer experience is the bedrock on which the multi-award winning company was founded in 2006 – and is attributable to its continued year-on-year growth, profitability and recognition. Colin Tourick, Professor of Automotive Management at the University of Buckingham Business School, reinforced that an NPS of 94 is outstanding both within the leasing sector where the average score is 52* – and outside the sector where highest ranking companies include Apple with an NPS of 63 and Netflix at 62**. Prof Tourick who has four decades of experience in the automotive sector says the NPS system has been widely adopted by businesses around the world. Synergy’s passion for excellence is further recognised by Feefo, the world’s most trusted ratings and reviews site which Synergy uses to survey all its customers. Earlier this year Synergy achieved the Gold Trusted Service Award for delivering a 5-star rated customer experience for the fourth consecutive year from 2015-2018. 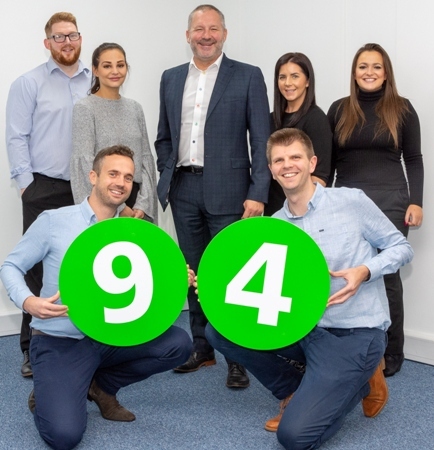 Feefo also confirms Synergy’s outstanding 94 NPS score is exceptional when compared to their clients in the automotive sector posting an average score of 71. A champion of Yorkshire businesses and proud regional employer, Synergy has marked a 50 per cent staff increase in 12 months, bringing the team to 40 strong. The company is also nearing the completion of a major expansion programme to double the size of its Harrogate headquarters as part of a five year plan to expand the business by 300 per cent.